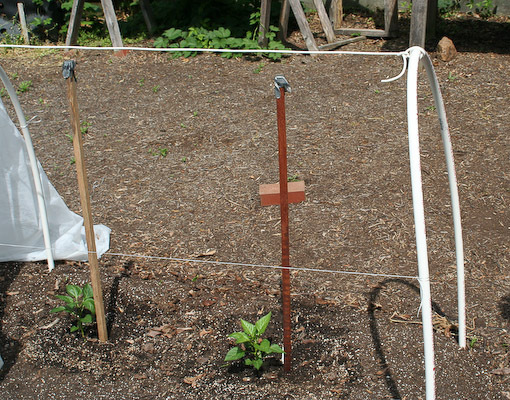 Here’s a relatively easy way to cover staked determinate-type tomato cultivars and pepper plants with floating row cover to prevent brown marmorated stinkbug feeding. I built two low tunnels for the Grow It Eat It demo garden at the Home and Garden Information Center. They are 2 ft. wide and 18 ft. long. I hammered ten, 2 ft. long pieces of 3/8 in. rebar, 10 inches into the ground along each side. The rebar pieces are 2 ft. apart across the row and 4 ft. apart in the row. I then cut ten, 10 ft. long pieces of 1/2 in. pvc water pipe into 8 ft. long pieces and inserted them over the rebar to make five bows. I'm also using PVC row covers in my raised garden beds this year. Everything looks so much healthier than last year, and the row covers maintain good moisture levels and protect young plants from winds. 1. Cost of the 18' tunnel–the works? 2. Can the typical gardener–one person–easily open and close the tunnel for cultivation and, I assume, checking to see BMSB's somehow have gotten inside? 3. 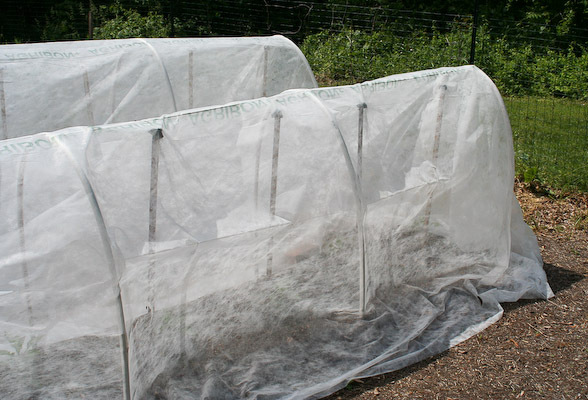 Are you going to try to adapt the structure to protect indeterminate tomatoes, which most of us grow–and for our raspberries and blackberries and other “tall” crops? Thanks for the exciting start! Side note about row cover from personal experience. Don't use green colored row cover. I got some and thought it would be great to use in my suburban back yard because it would blend in better. But it seemed to block a lot of the important light spectrum from my broccoli plants in just a few weeks. I planted it to keep out the cabbage moths. When I removed it, the plants were stretched out and the developing heads were small and sparse. As soon as I removed the green row cover and harvested the heads, the plants thickened up and the side buds are developing nicely. Costs can be reduced by using what's at hand. The useful life of the bows and rebar is >10 years. Row cover and string will need to be replaced every 2-3 years. I'll be posting some photos of two other designs- one suited for indeterminate tomato cultivars. Witch king of row cover is on your picture? The winter one or the summer one ? @ John T – Where did you purchase the floating row covers? Locally? I'm looking to find some affordable ones and not sure what I can use. Do you recommend something at home depot? Summer one- very light-weight; about .55 oz./sq. yd. It is more difficult to find in retail stores. I have noticed it in two Southern States Co-op stores (a 40’X50’ piece for $15). I have also spoken with some hardware stores who are trying to stock it. Several large garden centers I contacted recently did not have light-weight FRC. Your best bet is to call ahead. 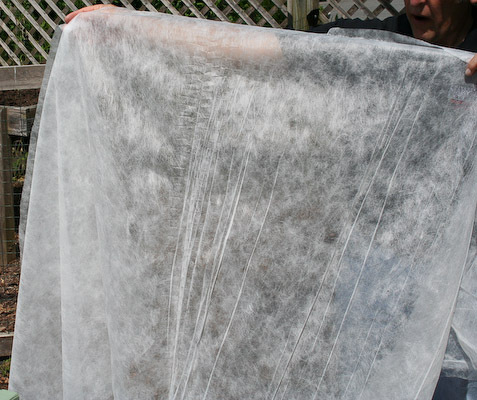 Be aware that store personnel may think you are asking for landscape fabric or will try to sell you bird netting as a substitute. If your favorite retail stores don’t carry it ask them to try to start stocking it.